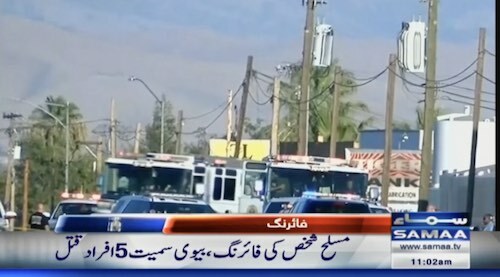 Six people are dead after a man in Bakersfield, Calif., went on a shooting rampage on Wednesday that began at a trucking business and ended about 15 minutes later with the suspect’s suicide, a local sheriff said. “Six people lost their lives in a very short amount of time,” Kern County Sheriff Donny Youngblood said during a Wednesday night news conference. Youngblood said the shooting spree began about 5:20 p.m., when the unidentified suspect and his wife arrived together at a trucking business in an industrial complex in east Bakersfield. During the confrontation, the suspect fatally shot the man — then turned the gun on his wife, killing her too, Youngblood said.